Hockey Book Reviews.com: Finger Hockey: No Poke Checking! Finger Hockey: No Poke Checking! In what may be the most unusual hockey "book" release of 2011, Running Press Miniatures Editions releases the 32 page Finger Hockey: No Poke Checking! Here's more from the publisher: Why get bruised and bloodied playing the treacherous sport of hockey on an ice rink when you can do it right on your desktop? This is a game that the millions of rabid hockey fans around the globe will love. 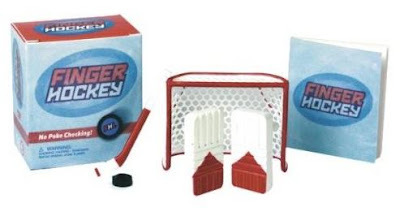 Kit includes a set of finger “goalie” pads, net, hockey stick, puck, skating rink playing mat, and a 32-page rule book on Finger Hockey.